Next year will be filled with movies that already have major buzz, from comic book sequels in “Iron Man 3” and “Thor: The Dark World,” to a trip back to OZ and many original movies like M. Night Shyamalan’s “After Earth,” “Gangster Squad” and Guillermo del Toro’s monster film epic “Pacific Rim.” One film near the top of my “Must See” list for 2013 is “The Great Gatsby,” adapted from the renowned literary classic written by F. Scott Fitzgerald and directed by the visionary and talented Baz Luhrmann (“Romeo + Juliet,” “Moulin Rouge!”). After seeing the first trailer back in May, which established the glamorous world of the roaring 1920s New York upper society, we have been clamoring for more details on the project. Especially when the film was moved from its Christmas opening to avoid contending with major films in December such as “The Hobbit: An Unexpected Journey,” “Jack Reacher,” “Zero Dark Thirty” and, of course “Les Miserables.” Now, with its May opening, it has no comparable films to go up against, just action flicks and comedies, which will help it go unopposed in the drama department at the box office. This second trailer for the film focuses on the man in the middle of the story, the titular Jay Gatsby (Leonardo DiCaprio) and all the drama that surrounds him. “The Great Gatsby” tells of Nick Carraway (Tobey Maguire), a Yale graduate and World War 1 veteran who moves from the calming Midwest to the bustling city of Long Island where he lives close to a mansion owned by the infamous and mysterious millionaire, Jay Gatsby. Nick is quickly whisked into a world unlike any he has ever known; full of luxury and excitement. He finds himself ensnared in the flurried maelstrom of deceit, betrayal and lust between his own cousin Daisy Buchanan (Carrey Mulligan), Gatsby, Daisy’s cruel husband Tom (Joel Edgerton) and his mistress Myrtle Wilson (Isla Fisher), and Myrtle’s mechanic husband George (Jason Clarke), a man heartbroken over his own suspicions of his wife’s indiscretions. Filled with jealous rage, murder, deception and a long-lost love, “The Great Gatsby” is considered one of the great American novels of the 20th century and is still a popular book 87 years after its publication. So have you read “The Great Gatsby” or seen any of its many incarnations over the years? Do you think it deserves the big screen treatment filled with an all-star cast? Interestingly enough, it was also filmed in 3D, which makes sense for the fanciful and illustrious visionary style of the director Baz Luhrmann, but also begs the question “Does drama really need to be in 3D?” My thoughts based off the luminous take on this story are that the added dimension will help immerse the viewer even further into this fantastical world and time in history. I am a fan of this format — when done properly — and understand the difference between 3D used for depth and the gimmicky 3D used for shock factor. Leave a comment and let us know what you think of this second look into the film and if you will see it in 2D or 3D. 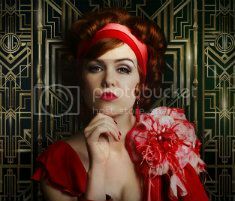 I love that image of Isla Fisher. By far, I enjoyed this trailer than its first trailer.